In a country full of surprises – desert elephants, giant sand dunes and lunar landscapes – the town of Swakopmund doesn’t disappoint. Bavarian church spires – a legacy of its colonial past – poke out of a coastal fog; pelicans flap between street lampposts. Visit Swakopmund in October – you’ll hear the sound of a traditional German ‘Oompah band’ at the local beer fest. Lying on the Atlantic coast halfway between the dunes of Sossusvlei and the wildlife of Etosha National Park, Swakopmund is the ideal stopover for travellers. There’s everything you need to refresh and resupply: quality accommodation, well-stocked supermarkets, Wi-Fi and ATMs are all available. The atmosphere is safe and friendly, coffee shops and delis abound and if you’re a German speaker, you’ll find a lot to talk about! Drawing on its popularity, this friendly seaside town offers much more than a place to stay for a night, especially for nature lovers. It’s a great opportunity to compare Swakopmund’s desert and ocean animals with the big game of Etosha and Damaraland. Desert tours introduce you to the mysteries of the Namib, your guides pointing out wildlife and prehistoric plants; ocean tours showcase Swakopmund’s marine life; bird watching trips deliver both sea birds and desert specialists. 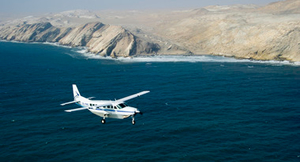 And for thrill-seekers, a Swakopmund holiday is perfect. 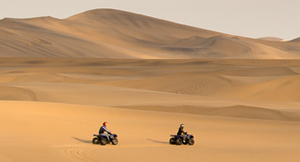 Expect a wide range of white-knuckle adventures – quad-biking, sky-diving, ballooning and sand-boarding. Scenic flights are also recommended, the best way to appreciate the scale of this elemental landscape. 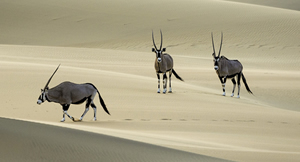 Talk to us about including Swakopmund on your holiday itinerary; it breaks up the journey between Namibia’s southern destinations – Sossusvlei and Namib-Naukluft Park – with the country’s northern ones – Etosha, Damaraland, the Skeleton Coast and the Kaokoveld. For families on a self-drive holiday it is an opportunity to let the children run on the beach or slide down a sand dune. 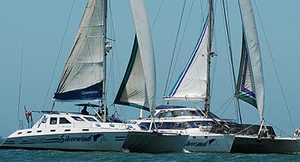 Browse our recommended itineraries or simply contact us for a tailor-made holiday. 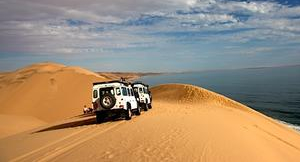 Whether it’s by 4X4, quad bike or camel back, tours from Swakopmund go into the Namib Desert. 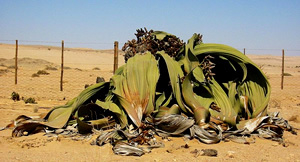 Thrill seekers can ride giant sand dunes; botanists will want to see the living fossils, the giant Welwitschia mirabilis plants. Boat trips give you the chance to spot marine life; your guide will be on the lookout for dolphins, seals, pelicans and ocean birds. Spring months see the arrival of migrating whales. Home to one of the widest ranges of adventure activities in Southern Africa, Swakopmund is a place for sky-divers, 4X4 drivers and ocean anglers. Ask us about the right adventure for you. Swakopmund marks where the dunes of the Namib Desert crash into a foaming, turbulent Atlantic. This clash of the elements is best seen from above – try a scenic flight by light plane or hot-air balloon. 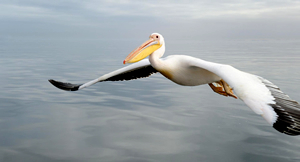 Nature lovers will be happy to hear that nearby Walvis Bay is one of Namibia’s birding hotspots; tours take in coastal wetlands as well as unique desert habitats – highly recommended for keen bird watchers. 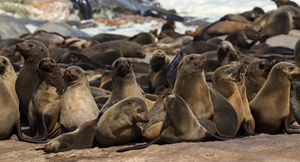 Namibia’s shipwreck-strewn coast begins just north of Swakopmund, opening with the Cape Cross seal colony, a dramatic, heaving mass of tens of thousands of Cape Fur Seals with jackals lurking on the edges. 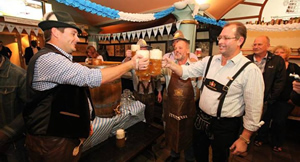 Swakopmund’s German heritage can be enjoyed all year round but there’s not much that can beat the experience of Swakopmund’s October beer fest, mirroring its Bavarian counterpart with as much enthusiasm. Best seen at sunrise or sunset, the extraordinarily shaped Lunar Landscape lies out in the desert. A highly eroded set of cracked hills and ravines, these evocative ‘badlands’ make for wonderful photography.